A loosie is a single cigarette that can be purchased illegally in some of the bodegas and smoke shops of the neighborhood but be warned, if the proprietor of the business doesn’t know you or you look like a D.T. (undercover cop), you will not be able to obtain said loosie. For the most part, a loosie is synonymous with Newports but a few of the smoke shops also offer Marlboros. Back in the day, when I was a kid coming up, loosies were 10 cents. Now that a pack of cigarettes are like a hundred dollars, a loosie can be purchased for the ungodly sum of a dollar. Some enterprising individuals are buying packs and selling loosies themselves, just to support their habit and make some money on the side. Another term that is affiliated with a loosie is a bust down. The bust down is when you give someone else the remainder of your cigarette. The way it works is that as soon as someone you know sees you with a loosie, they will shout out – ” let me get a bust down”. But, now that a loosie costs a whopping dollar, folks are much more reluctant to give bust downs. In fact, people are actually smoking their loosies all the way down to Brownsville, which is the very end of the loosie where the tobacco meets the filter. A picture is worth a 1000 words and I think this picture explains Uptown’s latest fascination with Hookahs. This young man took it to a whole new level and made his portable. I was visiting my boy Jason at Nostylgia one day and saw this dude out side his store smoking a hookah from his backpack. I had to snap a photo and share how random uptown can be sometimes, lol! DYCKMAN IS ABOUT TO ADD THE WINE TO ITS DINE! Now you got one more reason to spend time uptown and save on your downtown metro card swipe…reason being, a wine bar is looking to open soon, on our very own “Restaurant Row” (Dyckman Street, west of Broadway). On a strip full of dining establishments (ranging from Sushi(Mama Sushi) to Traditional Diner dishes (Park View Restaurant), it will be very satisfying to find a locale where you can sit and just enjoy a nice glass of Shiraz, without the “clikkity clak” noise of silverware hitting plates, or the mash-up scent of foods in the air, when all you’re looking for is the aroma of crushed grapes. 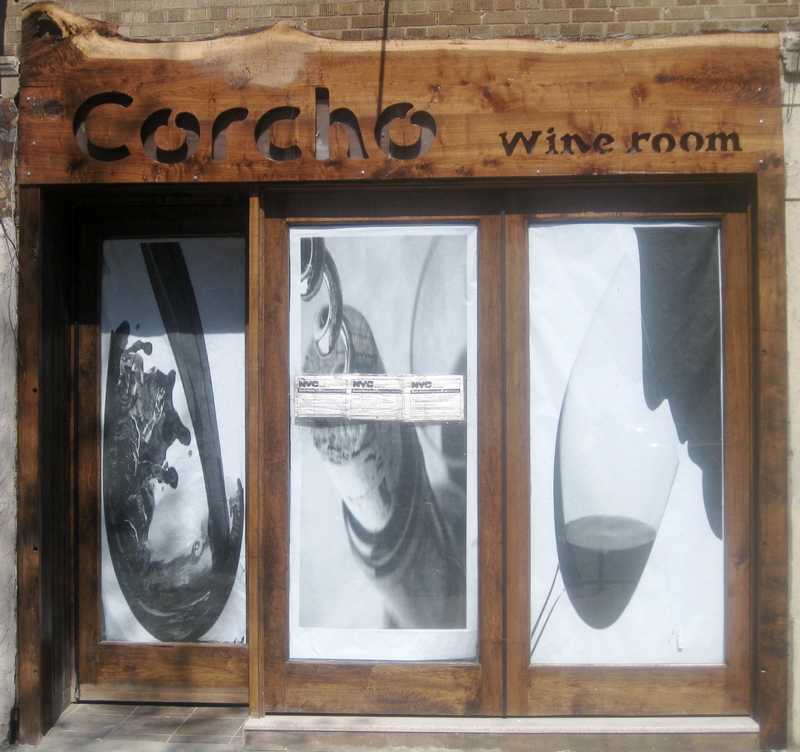 From the outside facade and a peek inside at the interior, Corcho (Spanish for Cork), on 227 Dyckman, could potentially be a new hot spot Uptown. Cheers! If you don’t know what a Pale (pronounced pa le) is, chances are, that you are not Dominican. A Pale is any combination of 2 numbers that a person chooses as their pick for the Dominican lottery. Typically, depending on where you play your numbers, each Pale pays $1,100 for each dollar a person plays. So if your Pale were to hit and you bet 5 dollars you would win $5,500. The Dominican Lottery’s range of numbers is from 1 to a 100 as opposed to let’s say the Mega Millions, which is from 1 to 46. 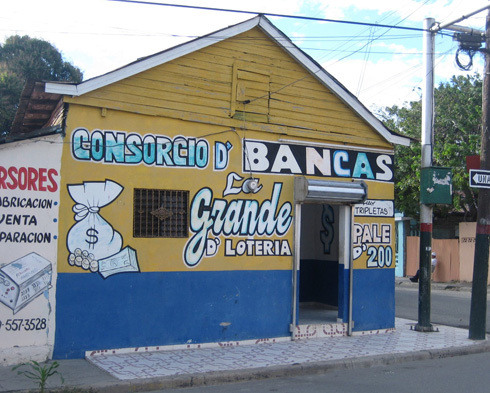 Back in the day in the 80’s, Dominicans in New York City only bet on the Dominican lottery on Sundays. Now a person can play their numbers, if they know where to go, any day of the week. Another thing that has changed with the Dominican numbers game since I was growing up, is that is has pretty much been driven underground. Literally – one of the places that I have played my numbers was a basement that you had to go through a nasty urine smelling alley to get to. Not too long ago, one was able to play their numbers in anyone of the many bodegas that somehow exist in the Heights. Believe me, that’s a whole lot of bodegas. There are about 3 bodegas on each block in the hood. That is no longer the case; constant police harassment has sent the Dominican numbers game, better known as Los Numeros, in the Heights to less conspicuous places. Word of mouth is usually the way a person finds out where they can place their bet. It is usually in the back of a legitimate business, a bakery, a salon or a barbershop. In the corner of said business, there will be an older, sharply dressed Dominican man with a beret on his head (Dominicans called these hats boinas) and a toothpick in his mouth. That’s the numbers man. While the definition of a Pale, is pretty much straight forward. How one picks a particular Pale, is something else altogether. The Pale that I play, every once in awhile (yeah right), is 8 and 13, my birthday. Other folks play their year of birth or the year that they came to this country, but the real foundation for the choice of which Pale to play is a person’s dreams, their Sueños. What you dream about you usually dictates what numbers you bet on. There is a whole pseudo-science dedicated to understanding the numerological meaning of everything imaginable. Everyone has that aunt or uncle that can tell you the exact Pale to play. For example, if you have a dream that you’re dancing Perico Ripiao with Fefita La Grande, in the middle of a rice field during a hurricane, that means that you should play 17 and 76. My mom once had a dream of me as a child on a donkey with my back to her. She in turn, played 80 & 31 (my birthday backward) and ended winning about $5,000. Needless to say, I never got my fair share of that money. Me, well – I haven’t yet hit the big one but I know it’s just around the corner. God is waiting for me to really need the dough before he blesses me with it. This morning in the deli where I buy my morning bagel, I played the Mega Millions, just in case, you never know. You see, I don’t really want to be rich; I just want enough money to live comfortably. To be able to pay the mortgage, feed and clothe the kids without having to work that spirit-crushing, corporate nine to five. To be creative full-time, without having to worry about paying the bills, is my dream. I know it’s out there and on it’s way. So tonight if I don’t hit the Mega Millions, I’ll be looking for the numbers man on Sunday to get my numeros fix on. That big beachfront house in DR is just waiting for me to purchase it. Hey, a guy can dream can’t he?